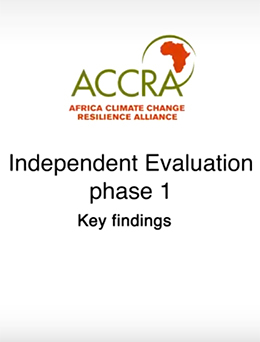 This multimedia video report presents the findings of the mid-point evaluation of ACCRA, produced by Patricia of Owl RE. 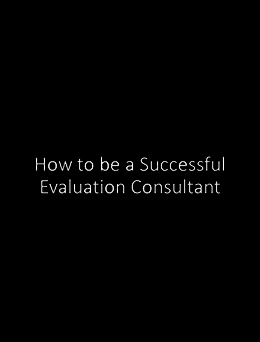 The video supported the project in communicating the evaluation’s findings and was used as support for workshops in other regions of the world. 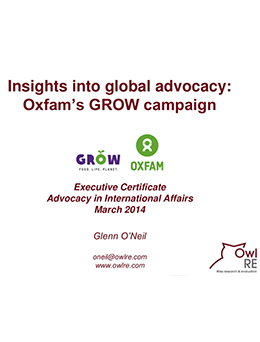 An overview of Oxfam’s GROW campaign, a global campaign on food justice; originally presented by Glenn for the Executive Certificate – Advocacy in International Affairs, the Graduate Institute, Geneva, Switzerland, March 2014. 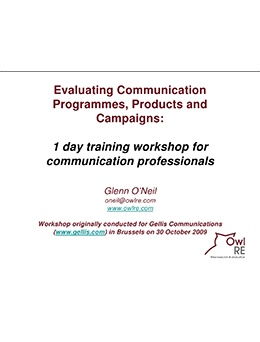 This presentation is for a one day workshop on evaluating communication programmes, products and campaigns. The main steps and methods are covered with real life examples given. This workshop was originally conducted by Glenn for Gellis Communications in Brussels in October 2009. 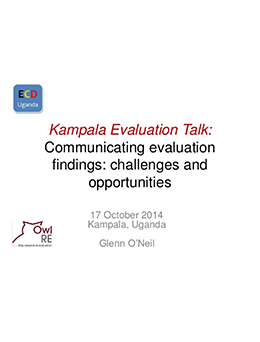 Presentation originally made by Glenn on the challenges and opportunities to communicating evaluation findings at a Kampala Evaluation Talk, 17 October 2014, Kampala, Uganda for the The Uganda Evaluation Association as part of the GIZ project on Evaluation Capacity Development in Uganda.